Fort Pierce, Fla. — A Band of Anglers, the umbrella company founded in 2017 by Patrick Sébile, which owns multiple fishing tackle brands including Ocean Born, Hyperlastics and Engage, has acquired SpoolTek Lures. SpoolTek is renowned for its patented concealed leader technology. The SpoolTek name is derived from a patented lure design containing a built-in spool that conceals a stainless steel leader inside the lure. When a fish strikes and the angler sets the hook, the leader is deployed by unspooling. This revolutionary design provides two distinct advantages: (1) it allows the angler to use a lighter leader (or no leader at all), which allows for a stealthier approach and helps to prevent the line or leader from being cut by sharp objects and toothy species, and (2) it creates distance between the hook and the weighted lure body, preventing the fish from throwing the hook with a head shake by leveraging the weight of the lure. These two advantages result in many more fish hooked and landed. SpoolTek’s leader technology is the product of snook specialist Dave Justice and medical device inventor Chris Walsh. They combined their passion for fishing with innovative problem solving to come up with a system that gives every angler a better chance to hook and land the fish of his or her dreams … even toothy species that often leave lines and hearts broken. Currently, the SpoolTek Pro Series of swimbaits comes in two models — the Fatty and the Stretch. The Fatty comes in three sizes — 4-inch (1/2-ounce), 6-inch (1 3/4 ounces) and 6-inch Extra Heavy (3 3/4 ounces). The Stretch is 9 inches long and weighs 2 ounces. Thus, there’s a size and weight for virtually any freshwater or saltwater species, and A Band of Anglers will be introducing even more baits featuring SpoolTek technology in the near future, both growing the range of swimbaits and utilizing the patented technology in other lure designs. A Band of Anglers, Inc., is the brainchild of legendary international angler and tackle designer Patrick Sébile, winner of dozens of national and international design awards and the only person ever to sweep the Best Hard Lure and Best Soft Lure categories in the same year at ICAST (2009). A Band of Anglers’ products are designed and developed by Sébile and his team of talented and innovative anglers from around the world. The company’s tagline — Authentic. Passionate. Real. — reflects its commitment to bring the best fishing products to the marketplace at a fair price and a great value. For more information, please visit www.abandofanglers.com and spoolteklures.com. 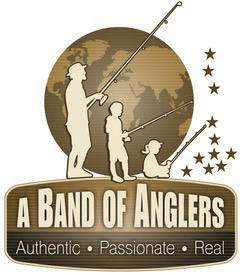 Inquiries or purchase orders can be emailed to Orders@ABandOfAnglers.com.